Returning home to Iowa is not exactly what Grace Kleran had in mind. She never looked back after high school, only looking forward as she studied and realized her dream of living in New York City. The fashion industry is all Grace has ever wanted to be a part of and after six years of sweat and hard work, she has finally gotten her opportunity to be the lead designer. Her presentation was perfectly executed and her designs were some of her best. But, instead of getting the top job, she is fired. With no money in her account and the bills piling up fast, she is forced to return home to small-town Iowa. Grace needs to confront her past, first her grandma and the memories of her parents’ accident. Then all kinds of emotions are stirred up when her high school sweetheart, Tucker, appears to still be available. She has some apologizing to do and some friendships to mend. But she also needs to find a way to make some money. She has no intention of staying in Iowa and is looking for the fastest way back to New York City. On a whim, she designs a dress to sell on Etsy. It sells so fast she may have found a way back to her dream sooner than she thought. What I love about Stuart’s books is that we can see ourselves in many of her characters. Stuart takes great care to show readers that real life can be messy and unpredictable, but with family, faith, friends, and determination we can get past the struggles and hardships. Grace has a talent that may be too big for small-town Iowa, but taking the girl out of Iowa is easier than taking Iowa out of the girl. Grace grapples with being true to herself and her designs while taking risks to make it big. Sometimes the mistakes show us what is truly important. The various characters, both the New Yorkers and the Iowans, are easily imagined right down to their choices of clothing, like the seersucker pants on Grace’s New York co-worker or Tucker’s jeans and work gloves. The fashion including Grace’s designs and what specific characters are wearing are part of the important details of the story. Stuart takes great care in creating characters that are likable and that the reader roots for. The romance between Tucker and Grace is realistic and builds slowly in the background while Grace tries to fit her way back into the lifestyle of her small town. The hard-working values of Iowans helping their neighbors and friends appear in the scenes. The book is full of heart, whether it’s in the designs Grace creates, the relationship with her grandma, her love for Tucker, or the feelings of home. Stuart’s wit and humor fill the pages along with her desire to share her love of family, faith, and small-town values. The novel feels like a warm hug and while there are sadness and anger around us, escaping in a book can remind us there is still goodness in others. I was absolutely thrilled to have the opportunity to interview Kim Stuart. She was a treat and we had so many laughs during our talk. I hope you all feel like you have met a new friend after reading this, because I sure do! 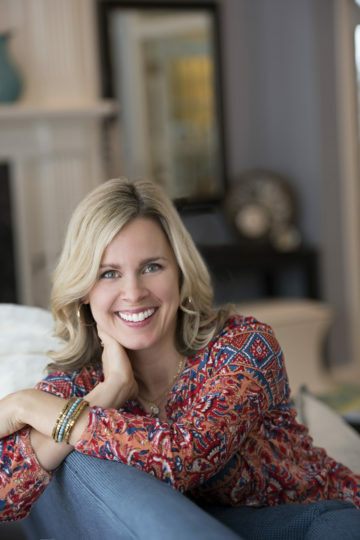 Author, Kimberly Stuart took a break from her vacation in Okoboji to chat with me about growing up with strong Iowa values, her writing process, our favorite romcom movies, and so many other side stories that I can’t share them all here. In just over an hour I felt like Kimberly and I could be life-long friends or at least have lots to laugh about together. Stuart thinks of reading as an escape and typically starts each novel centered on a main character with an interesting career because it’s a way to interest the reader. She has written about an opera singer, a veterinarian, a pastry chef, and most recently, a fashion designer. She wants to create a character that she enjoys spending time with and finds interesting. The research behind her latest character, Grace, a fashion designer in New York City, was supported by her good friend Sarah, who attended the Fashion Institute of Technology in New York City and is the owner of the boutique, Dornink in Des Moines. Those connections help Stuart create realistic characters and the details that are important to her. 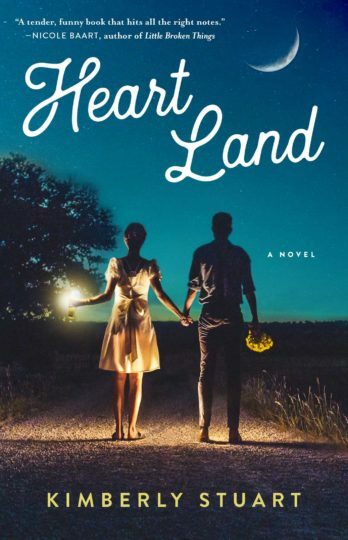 The title of her newest book, HEART LAND is a play on both Iowa being the geographic heartland of the country, but also the big-heartedness of the Midwest and the people in it. In the novel, Grace ran away from her home and coming back, she was still greeted with open arms by the people she shunned. Stuart wants to share the big hearts of Iowans in her stories as well as their strong work ethic and the idea of neighbors helping neighbors. She even put bits of her Grandmas’ characteristics into the book because they showed her how to be full of life, have a love for hard work, and the importance of a great sense of humor. Even though her books include a romance, that isn’t the main focus of the story. Her relationships are real including marriages that struggle, relationships that take a lot of hard work, but most important have a lot of humor. Stuart wants to write about relationships like her parents’ marriage of nearly forty years. Romance in marriages that are fulfilling, fun, yet require work are real to her. Their marriage has been a huge gift and one she didn’t realize until she was older. Stuart is definitely celebrating. Setting up camp in the Target aisles and telling everyone she knew about her book being on the store shelves was a huge reason to smile. She knows this ride is a blessing and is looking forward to enjoying it as long as it lasts. If you are local to me, you can meet Kimberly Stuart at Barnes and Noble, Cedar Rapids on Tuesday, July 24 at 6:30 PM. She will be reading from her latest book, HEART LAND and signing copies of some of her backlist titles as well. HEART LAND is available at Target, Barnes and Noble, and your favorite independent bookstores. ORDINARY GRACE by William Kent Krueger – See my review, HERE and my interview with him, HERE. My review of BETTER TOGETHER by Kimberly Stuart, HERE. Thanks to the publisher for sending a copy of this novel. If you chose to purchase the books through the above links, I may receive a small commission without you having to pay a cent more for your purchase. I want to read this! We used to go to church with the author! Becky, I think you would love the book. She has the best stories and is so much fun!